Like Italy, its much larger neighbor across the Adriatic, Croatia has a long coastline and a seafood-heavy Mediterranean cuisine built around grilled fish, scampi, mussels and calamari as well as goat cheese, dried ham and olives. At the same time, northeastern Croatia borders Hungary and is close to Austria, so Eastern European culinary influences are also strong. 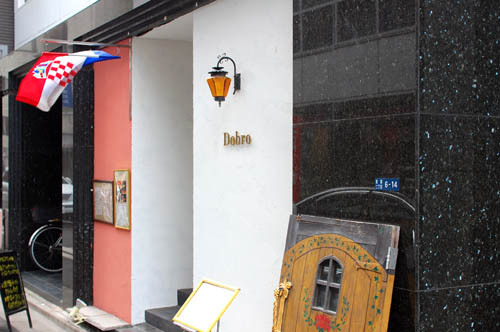 Dobro, a well-hidden Nihonbashi spot, does an excellent job introducing this often overlooked cuisine to Tokyo diners. The simple but elegant marble-walled dining room is reached by decending half a flight of semi-circular stone steps; a large mural painting of an Adriatic fishing village stands at the entrance, and antique carvings and smaller paintings decorate the walls. The room looks like it could have been an expensive jewelry boutique before it became a restaurant, and it's furnished with about ten well-spaced tables. The crowd is a mix of well-dressed couples and after-work office parties, and there's a slightly formal feel to the proceedings. 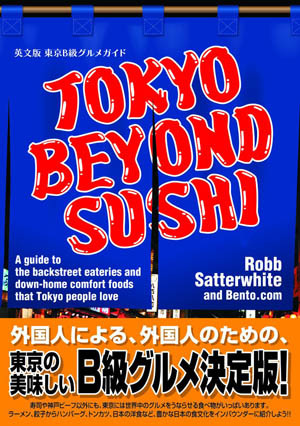 The food is more of a draw than the atmosphere, though, and it's rather unique within Japan. Main dishes include items like grilled duck with beans; rabbit goulash; Dalmatian-style prawns and other seafood - all with distinctive, unusual flavors. The goulash, for example, isn't quite the heavy peasant stew one might expect - the spicing is subtle, the meat tender and flavorful, and the asparagus, turnip and other vegetables firmly textured and crunchy. The cuisine's Italian influence can be seen in the Croatian-style lasagnas, risotti and pastas, with variations like truffle risotto, scallop risotto, and pasta with venison ragout. There's a "chef's special" risotto, and a recent offering incorporated fresh seasonal mushrooms, tomato, and some of the tastiest shrimp we've had in a long time. A la carte portions are just big enough to share, but small enough to eat alone if you've got a good appetite. Other dishes include good home-made pork sausages, served with lots of fresh pepper; foie gras w/ red wine and fruit sauce; a nice raw fish appetizer with mango and raspberry sauce; and delicious stuffed cabbage, made with traditional soured cabbage wrapped around a salt-cured mix of ground pork and rice. The home-made bread is fantastic - dense but easy to chew, with a crunchy crust - and it's usually served with some sort of savory spread - meat rillettes or cheese mixed with soybeans. The Croatian wines are interesting to try - hearty and spicy, yet smoother than expected - but the Y4500 Australian shiraz may be just as good a choice. In addition to a la carte, Dobro also offers prix-fixe dinners (Y4200-10,000) and lunches (Y1600-4800). Although the Croatian chefs who were here at the restaurant's opening in late 2003 have returned to Europe, the Japanese kitchen staff have learned well from them, and Dobro's cooking is confident and solid.